Based on George A. Romero’s classic 1968 movie of the same name, Night of the Living Dead Live! translates the horror story to the stage. 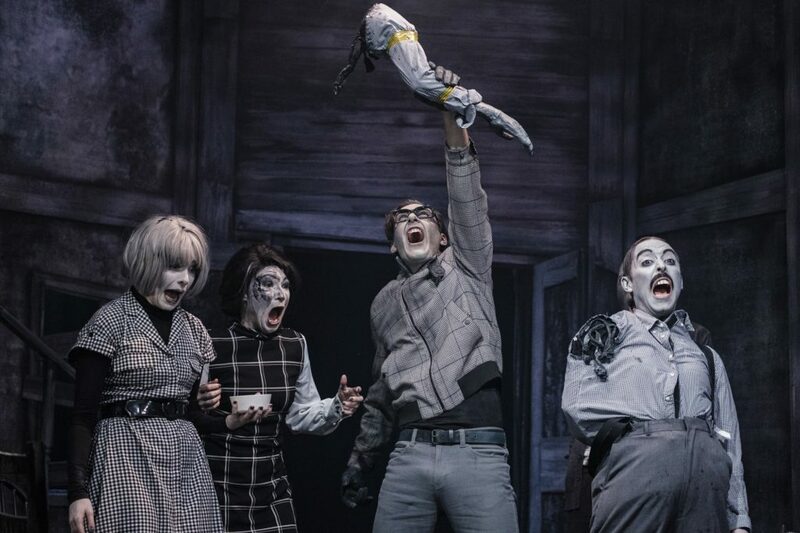 This comedic adaptation is stylish and performed brilliantly with some exciting theatrical twists, however it doesn’t quite live up to its horror-comedy expectation. The show opens with the murder of Ben (Ashley Samuels), who has been hiding in a house from ghouls, which are essentially zombies. Discovered by the Chief (Mike Bodie) and his sidekick Vince (Tama Phethean), the story then rewinds as we watch how the whole thing unfolded. An eclectic mix of characters assemble, including a squabbling couple, a soppy, loved up couple, and the seemingly vacant Barbara (Mari McGinlay). The first act follows the characters bicker and fight in their attempts at survival, and the second act then diverts from the original film narrative in its exploration of alternate endings; what if the leader of the group was a white, all-American man, or what if the leader was a woman? The show plays out every possibility to test which is the best method to survive the night of the living dead. The production is full of unique and inventive ideas that create an air of originality to the play. Firstly, a section of the audience is seated on stage, dressed in boiler suits and shower caps, literally seated in the middle of the drama. These members of the audience are invisible to the characters on stage, but they are not safe from the blood splatters and violence that plays out before them; the seating area is quite literally called the ‘splatter zone’. To my relief, I wasn’t seated on stage, but I enjoyed watching those who were – their amusement and horror at being covered in blood became a comedic element in itself. Secondly, the design of the production (Diego Pitarch) was stylish as it attempted to replicate the black and white aesthetic of the movie. The actors were all painted and dressed monochromatically, as was the entire set, and this was really effective in creating the old movie tone that laced the script and performance in general. This tone was heightened in the use of music; tense country music introduced the scenes (soundscape and compositions Samuel West) alongside dramatic, horror movie sounds (sound design James Nicholson and Paul Gavin) that kept all the audience on the edge of their seats – I heard people gasp and felt them jump when these sound effects were played. The production understood the importance of sound in creating tension and exploited it to its full advantage. Similarly, performances were strong all round, and every actor managed to intentionally embody that awkward style of the stilted, old-Hollywood performers. Jennifer Harding was a real stand-out, playing two very contrasting characters with absolute conviction and perfect comedy- both the characters of Helen and Judy became a joy to watch. Benji Sperring’s direction was neat and flowed nicely, and he certainly lived up to his ambition of wanting to make theatre fun. That said, there were moments in the drama that lacked significant tension that the design and performances couldn’t disguise. The play started off with a lot of promise but it took too long to progress the narrative. The mix of horror and comedy felt natural to the piece, but the first act slowed in certain places and while the second act redeemed it, picking up the pace, the repetitive structure seemed to stunt its potential rather than push it further. While some jokes sparked, other felt laboured and I felt restless rewatching certain pieces of dialogue over and over. Despite that, the stakes were definitely raised in the second act, and they became higher and higher culminating in a fun and bizarre conclusion that definitely ends the show on the high. Having not seen the original film, I was worried that some references would go right over my head, and perhaps that’s why I struggled to connect the whole time. I could tell some people responded well to the play and I have no doubt that those on stage had a really fun evening out because it does provide a unique theatrical experience. However, sat in the stalls I sometimes felt like there was a private joke I was missing out on. I’m sure fans of the film will have a great time, but despite its style and energy, I have to admit I was left a little confused and alienated by the whole thing.